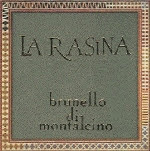 From the very highly rated vintage in Montalcino the 1999 La Resina Brunello di Montalcino shows beautiful aromas of cedar, Bing cherry, wet pavement, and a classic Tuscan earthiness. The flavors follow suit with notes of cherry, earth, chocolate, and a huge long finish. This wine is highly recommended and I score it 94 points. I continue to be amazed at the consistent quality of wines from this region.